Southampton’s research into free and open access has improved the way that research findings are communicated and has directly influenced UK public policy debates about research and innovation, had an impact on the economy and led to the development of digital archiving techniques that are widely used by the broadcast and film industries. Free and open access to publicly funded research offers significant benefits to all sectors of society but also requires sophisticated new systems to make research results useful for everyone who needs them. In order to meet this challenge software needed to be developed to enable organisations to deposit, distribute and archive their information effectively and efficiently while tackling the technical complexities of knowledge production. In recent years the open access model has been playing an increasingly important role in scientific publishing. There is a strong moral and economic case for publicly funded research to be freely accessible to all stakeholders – from industry to the general public. For the past two decades researchers at Southampton have been exploring ways in which to implement the open access agenda. A seminal paper published by Professor Stevan Harnad, from Southampton’s Web and Internet Science Research Group, sparked an international debate on systematically disseminating academic research online to address the limitations of traditional publishing. This was followed in 1995 by the launch of the Open Journal project and the creation of one of the first central open access repositories – Cogprints – to share the latest research in cognitive sciences. Research at Southampton has resulted in software products being developed that have enabled large numbers of research institutions to implement their own digital research repositories. The team developed EPrints, a generic, open source institutional repository system that can also be used as a platform to track the impact and use of each university’s research. They have also collaborated with the Centre for Research Communications at the University of Nottingham to develop and promote open access services. The University of Southampton is the only UK institution that has been carrying out research and development into open access, whilst also lobbying for policy change. Their research has had a significant impact on the economy, public engagement and practitioners. The launch of the online repository system EPrints in 2000 pioneered the notion that individual higher education institutions could implement repositories across all their departments. Since its launch more than 110 UK institutions have implemented EPrints, hosting 2.2million publication records. 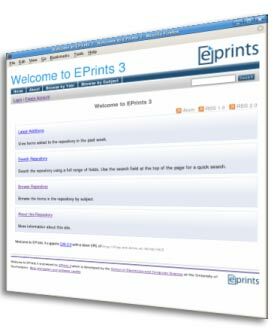 The popularity of EPrints led to the creation of a successful service business EPrintsServices that provides repository hosting services, training and consultancy to more than 100 organisations. EPrints Services employs seven staff and has generated more than £3m in revenue. The Southampton team was also instrumental in the formation of the UK Council of Research Repositories that is driving the recognition of repository administration and management as a professional function. Another successful new spin-out company Arkivum was launched in 2011 to provide archiving services for digital assets. Arkivum is a spin-out from our IT Innovation Centre and has secured £4m in venture capital funding, employing 17 staff. Southampton’s research into open source tools for preservation planning has also been used by digital archiving and audiovisual organisations such as the National Archives. The University’s researchers remain active in open access policy design and worldwide awareness raising by lecturing at global public events and being members of national bodies. Talk to our research team and find out more about this work. Professor Les Carr, of the Web and Internet Science group led the research on this project.